Speed is one of the five tools that scouts, coaches and management look for when evaluating talent, but one of the most neglected skills in the player development process. 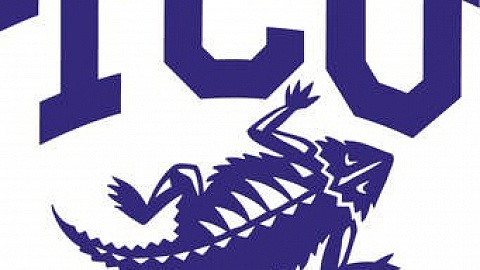 I realized the value of timing speed in college. We were running sprints in football and the first sprint was at half-speed, the second was at 60% and the third was 70%. The plan was to progressively increase speed every rep up to 100%. At approximately 80% of full speed I was out in front and based on my running speed at the time, there was no way I should have been out in front compared to the rest of the team. As we crossed the finish line, a big lineman picked me up by the shirt and said, “You idiot! The only difference between full speed and half speed is that you run at the same velocity, but make an uglier face!” I then realized that when training for speed, the only way to ensure quality of effort is to time every sprint. Speed Measurement Specific to Baseball. I started recording split-times electronically at 30 and 60 yard intervals during spring training in 1990. I soon realized that these splits didn’t always identify top performers in game situations. One of the slower players in the 30 and 60, Jeff Bagwell, was one of the best when going from first to third and second to home. He wasn’t fast in a speed test, but he knew how to run the bases. I then started timing all players (home and visitors) by hand as they ran from home plate to first base to determine speed where it really counts, in game situations. I have measured and recorded between 3,000 and 4,000 times each year for the past 25 years. These data indicate that the average player runs from home to first at about 85% of his maximum velocity and at 90% or faster about every fourth plate appearance (1). I recorded times from base-to-base, first to third, second to home, doubles, triples and tag-up plays from third. I also timed infield plays and release times for pitchers, catchers and outfielders. For the last ten seasons, I have recorded times from home to the halfway mark between home plate and first base (first 45 feet from home plate). These times indicate that a player who comes out of the batter’s box slow, can’t accelerate fast enough over the second half of the run to make up for a not running hard out of the batter’s box. As a result of these findings, coaches and management intensified their efforts to encourage players to explode out of the box and run hard over the first half of the run so they will have a better chance of being safe at first base should the infielder bobble the ball. Data indicate that when a player loafs out of the box and the fielder boots the ball, he can’t accelerate enough over the last 45 feet to reach first base before the throw (2). Data Results and a Culture of Timing. I kept a notebook of times and posted times weekly, monthly and quarterly for all players to see. The recorded data told them if they had been hustling out of the box or not and if they had lost a step. I also posted norms by position so players would know how they compared across the league and against other players at similar positions. The data were also used to help pre-evaluate trades. Scouts, coaches and management were able to see how the trade prospect compared to the player that the team was considering trading and to others at the same position. The data can also be used to determine if a player is maintaining or losing speed from season to season and to evaluate return from an injury. If a player gets hurt and says that he is running at 70%, it’s important to know what his speed was before the injury. If you don’t have a baseline, you can’t tell how close he is to returning to full speed. The data can also be used for motivational purposes. If, for example, you can show a player recovering from a hamstring injury that he is running at 95%, it can help build confidence and remove some of his concern that he could suffer a re-injury by trying to run fast. The data can also create a climate of speed awareness. I can’t tell you how many times players approached me during and after a game and asked, “What was my time on that one?” When a player was thrown out at home, the third base coach would often ask, “What was his time to third or how long did it take for him to get from third to home?” Coaches have also asked for times on players who were promoted from the minors. Players became so conscientious about time they would even ask how long the National Anthem was. A few years ago, a player was obtained in a trade and the third base coach asked if I had times on him going first to third and second to home, explaining, “I need some idea of his speed so I will know if I can send him; it helps me make decisions on unknown players.” In time coaches will develop a keen sense of how fast a player is running, but the initial information can help them bridge the gap. The data can also help players in the field gauge an opponent’s speed and decide how fast they need to get rid of the ball. I timed the outfielders from the time the ball hit their glove to the time it left their hand to encourage quality of effort and to let them know how they compared to others in the game. Players have been known to use this information to help them gear up for someone who they know runs fast. Economics of the Game vs. Traditional Speed Testing. Initially we tested sprint time electronically three times per year – during spring training, before the All-Star break and in September. After a few years, time was recorded only during game situations. The minimum salary in MLB is now over $500,000. If a player is injured to the extent that he has to miss games, the team not only has to play short-handed, it is also out a considerable sum of money. If the player has to go on the DL, the team has to pay his salary plus that of his replacement. The strength and conditioning coach can look real bad if a player gets hurt while participating in a speed test. If he gets hurt running the bases, it’s a part of the game and not the result of the testing program. Also, once a player is hurt during testing, some of his teammates will be reluctant to take the test and/or give max effort. Bring it to the Grass Roots. This system has applications for young, developing players. You can’t expect a coach to record 3,000 to 4,000 times per season, but he should establish a baseline. If a coach can get times even at the minor league level it will give him information as to the players speed and data that can be used to evaluate status from year to year. Speed, no matter where you play on the field, is important. It’s the only tool that is used on both offense and defense. If a coach can tell a player how he compares to others at the same level and position and whether he improved or didn’t improve over the course of the season, it can help motivate him to work on speed during the off-season. Working on Speed Development. We started off-season workouts approximately 4 weeks after the last game of the season with the goal of getting the players in shape to train hard. We followed this with a 6-week speed development program starting in January. In order to ensure consistent improvements and minimize the risk of injury, we worked short to long, i.e., we started with short, simple runs and progressed to longer distances and more complicated patterns (see article entitled “Short to Long Sprint Training” in the archives). We started with 10-yard sprints (10×10 yards) to improve acceleration, starting strength and power and progressed to 20-, 30-, 40-, 50- and 60 yard sprints. Players were given a target time and rest interval for each sprint (3). They performed the workouts and time was measured with a stop watch. Because players can’t work on speed development every day during the season, the goal should be to maintain it. Data show that most MLB players run enough on the bases and in the field during practice and game situations to maintain speed from opening day to October (4). I looked at speed data every day and prescribed workouts one day at a time. If a player got on base several times over 2-3 consecutive games, stole a couple of bases, went first to third or second to home or had a couple of infield hits and/or bag-bag plays, he was encouraged to back off running for a day. If he hadn’t been on or run the bases, he was encouraged to do some additional running before game time. Players sprint before games. As Yogi said, “you can see a lot by looking”. Watch your players when they run. Posture, starting angles and first step mechanics are important things to monitor during sprints. You can measure the length of the first step and compare it to what they have done in the past to see if it’s to short or long. 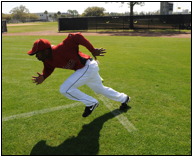 Have players run 10-yard sprints for time on the warning track with a goal of 2.0 seconds or less. Tens are safe and the most important part of a 30-yard sprint. Approximately 80% of top speed in the 30 is reached in the first 10 yards. Watch shin angle and body lean to make sure that force is being applied in the proper direction. Look at their footprints to see if they are stepping straight toward the target and to determine stride length. Are they using a drop step, crossover or spin step? If they use a crossover or spin step, see if they step straight ahead or across the body. Changing the placement of the lead foot in the start can quickly eliminate crossing over the body. Once they cross over, it can take up to 3 steps to get back on line. Do they pop up? If so, encourage them to stay down for the first 5-6 steps. Look at their recovery leg. Is the heel low on the first 5-6 steps or do they go into a high heel recovery pattern that inhibits their ability to accelerate? 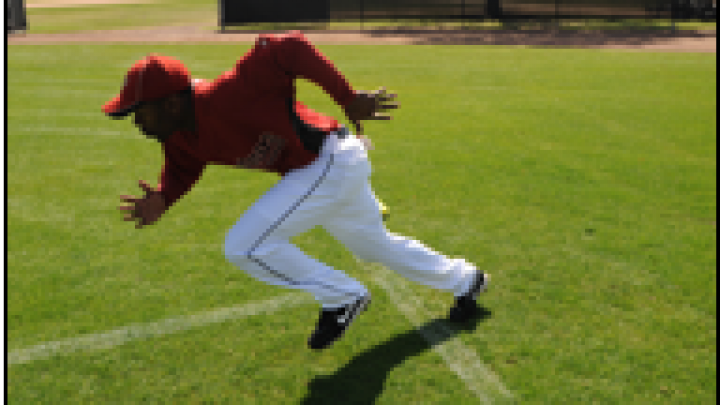 Players can’t safely run the bases for skill or conditioning during batting practice but they can run in the outfield. A player, for example, can simulate taking a secondary lead and getting off first base on a sacrifice bunt. Players can also run the curve on the warning track in center field to simulate going from first to third and second to home. They can work on breaks to simulate stealing a base, taking a secondary lead and rounding second base, tagging up at third, and stop and go’s to simulate pick-offs and run downs. Runs can and should be designed to simulate some aspect of the game, especially for extra men. Players should never run just to run. The ultimate determinant of speed is genetics. You can make everyone faster, but you can’t make anyone fast. After genetics, there are a variety of factors, such as body build, flexibility and strength that can influence speed. Some players aren’t nearly as fast as others from home to first especially those who are heavier and thicker. However, many can learn to from first to third quickly, especially if they have a low center of gravity. Players can be taught to round second without making a big loop, drop down, pivot and accelerate into third. A good base-running coach can help improve technique, but in the end, it boils down to wanting to be a good base runner and having the confidence to do it. Some players think, “I only run when I know I’m going to be safe or I don’t steal because it hurts when I slide.” Consider genetics, mechanics, mind set and willingness to work when planning your speed program. Time your players in game situations. Create a climate of speed awareness. It can yield valuable information and rewards in the long run. Coleman, G. and Dupler, T. Differences in Running Speed Among Major League Baseball Players in Game Situations. JEPonline, 8:10-15, 2005. Coleman, A. E. and W. E. Amonette. Pure acceleration is the primary determinant of speed to first base in major league baseball game situations. J Strength and Conditioning Research 26(6):1455-1460, 2012. Coleman, A. E. Target and recovery times for speed training in baseball. Strength and Conditioning Journal 23(6):6-7, 2001. Coleman, A. E. and T. L. Dupler. Changes in running speed in game situations during a season of Major League Baseball. JEPonline. 7(3): 89-93. 2004.